Many women dread going through what is sometimes referred to as “the change”, but what is scientifically known as menopause. Menopause is characterised as the transitional period a woman goes through after she stops having her menstrual periods for a period of at least one year. Usually, the menopause happens sometime after age 40 - often between the ages of 45 - and 55 - although it can happen earlier or later, depending on the woman. Menstrual periods stop when a woman stops menstruating, and thus ceases to be fertile. It means that she is no longer releasing eggs from her ovaries, and also that she will be producing less of the hormones oestrogen and progesterone. Some women prefer to have a medical intervention when they reach the menopause, to deal with some of the symptoms they might be experiencing. These can include anti-depressants to deal with mood swings, other drugs for hot flushes, oral contraceptive pills to calm irregular bleeding, and HRT, or hormone replacement therapy. Other women, however, prefer more natural ways of dealing with their menopausal symptoms, often in the form of dietary supplements. This is especially true when faced with taking HRT, which has been associated with a higher risk of breast cancer in particular, as well as womb and ovarian cancers. Black Cohosh. A flowering plant from the eastern part of North America, it is thought to help because of its rich plant phytoestrogens, which act like natural oestrogen in the body. Its promoters claim that it works well when it comes to alleviating vaginal dryness and helping control body temperature, among other things. Maca Root. Comes from the Andes in Peru, and is good for both men and women; the latter use it as an HRT substitute for perimenopausal symptoms, as well as PMT. Maca root is said to be good for hormonal imbalances as it works on the hypothalamus- pituitary gland, helping regulate the amount of hormones produced. Red Clover. Also contains phytoestrogens that are thought to be especially good to decrease unpleasant menopausal symptoms and help build strong bones, much like soy. Ginseng. 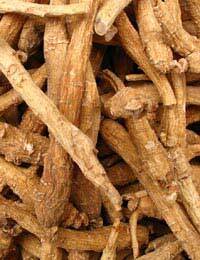 The ginseng plant is said to have two benefits; it can both improve moods, and also help with sexual arousal problems. One potential problem is that there can be serious side effects. St John’s Wort. This plant is said to both help treat mild depression and also be an effective remedy in dealing with sleep issues. Only the first of these claims has been proven, however. Taking St John’s Wort alongside prescribed antidepressants may decrease their efficacy. Many other supplements are available that claim to treat menopausal symptoms, but it isn’t really clear whether they do the trick or not. Your best bet is to consult with your GP, who can advise you on what to take depending on your own specific circumstances. Please be advised that some supplements – even ones that are 100 per cent natural – can interact with other supplements, as well as with prescribed medications. So always check with a medical professional before you take supplements of any kind. Are Supplements Necessary When Breastfeeding?